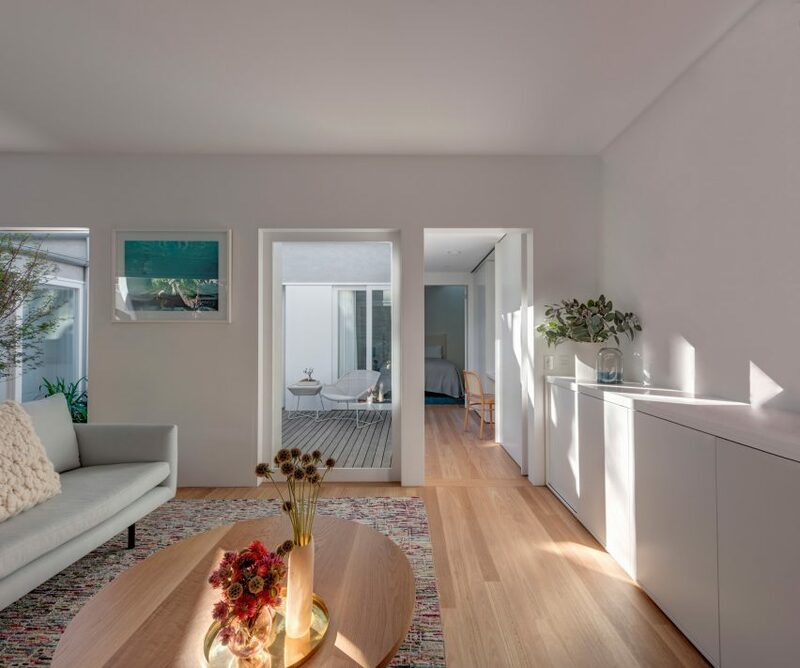 Local architecture studio Panovscott has modernised a cottage in Sydney by introducing a courtyard that the living spaces and bedrooms all open directly onto. The house, which was likely constructed in the 1980s, occupies a plot on a lane lined with a variety of small dwellings, garages and sheds, in a suburb of the Australian city. Rather than increasing the dimensions of the compact 75-square-metre building, the project overseen by Anita Panov and Andrew Scott’s studio focused on improving the existing plan and amenities. The owner’s original intention was to provide a bolt hole in the city for his mother, who spends most of her time in the countryside. The house therefore needed to offer a relaxing environment in a dense urban setting. 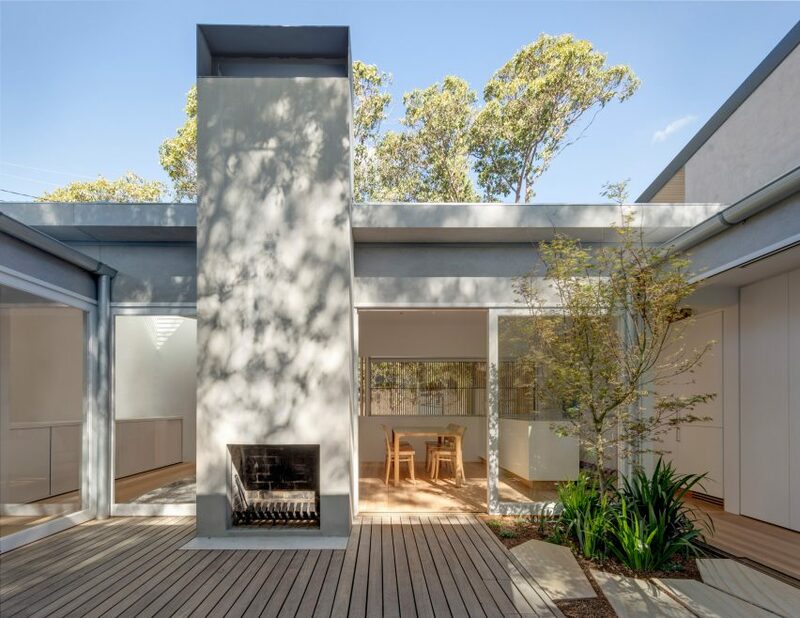 A sense of privacy and tranquility was achieved by inserting a small courtyard towards the rear of the building that provides an open-air space with views of the sky and nearby treetops. 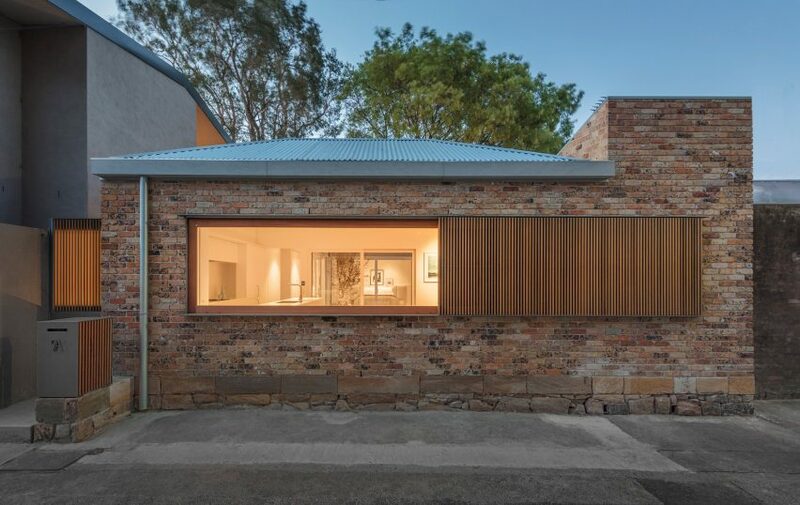 A rural quality of neighbourliness is also promoted by introducing a large window onto the lane, which can be entirely opened to create an unobstructed connection with the outside, or shielded by a sliding slatted screen. 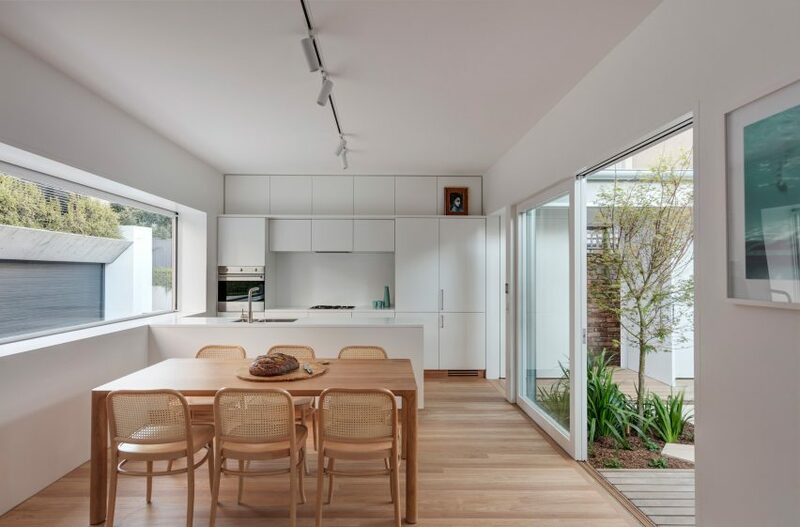 “Standing in the kitchen it is possible to engage with the street, with the court, and each of the private spaces within the interior,” the architects suggested. The street-facing elevation was replaced with a uniform surface of sand-stock brick. The material complements the hue and texture of the stone foundations, which are the only part remaining from the earliest structure built on the site. According to the architect the brick lends the building a monolithic yet texturally rich quality due to its speckled surface, which will weather over time as the rough surfaces gather dust and dirt. A similar process will also see the cedar screen in front of the window mellow as it is exposed to the elements. The main interventions inside the building included swapping the positions of the bedrooms and living areas. Communal spaces are now to the front of the house facing the street, while more private rooms are tucked away at the rear. A slatted-timber gate to the left of the cottage opens onto a brick-lined passage leading along the side of the dwelling towards a new entrance marked by a slender steel awning. 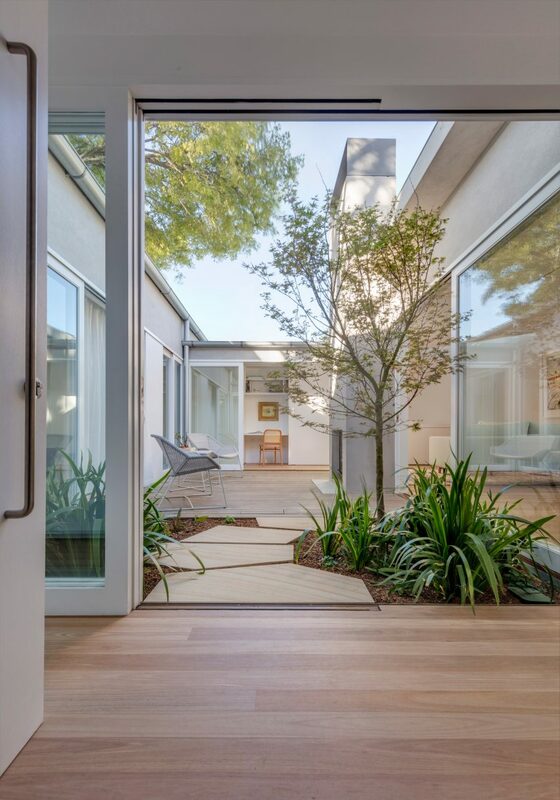 Beyond the front door is a courtyard garden, reached by crossing the threshold of a corridor containing utility spaces including the laundry, storage and a pantry alongside the kitchen, through sliding glass doors and out onto stone pavers that lead to the decked outdoor living space. A concrete fireplace provides the focal point for the courtyard, with its chimney extending above the existing roof line. A small study is accommodated in a space lining the eastern edge of the courtyard, opposite the entrance. To the right of the entrance is the open-plan living space. 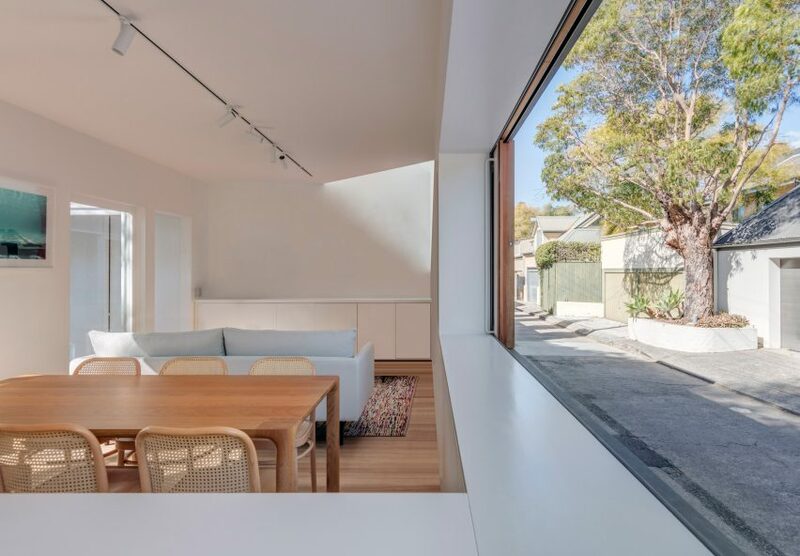 This room receives natural light and ventilation from the window, while a new roof light that projects upwards from one corner of the facade provides additional illumination. The living area is lined with sliding glass doors along its northern side that can be opened to connect the space with the courtyard and allow a breeze to flow through from the window. On the opposite side of the courtyard are a pair of bedrooms and a bathroom. The bedrooms look onto the central outdoor space and each incorporate a skylight in the rear corner. The shower area in the bathroom is topped with a large piece of glass that illuminates a white-tiled space with a floor made from polished concrete. Photography is by Murray Fredericks.